The Eco-Pole is a freestanding lamp post that uses a 60W LED light rated for 50,000 hours of use. 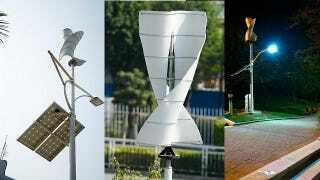 Instead of drawing power from the public grid, it relies on a combination of dual 90W solar cells and a 300W micro-wind turbine for energy. The process is completely self-contained and uses just a fraction of the energy conventional lights need—usually 250W and up—while producing zero emissions and requiring very little upkeep.